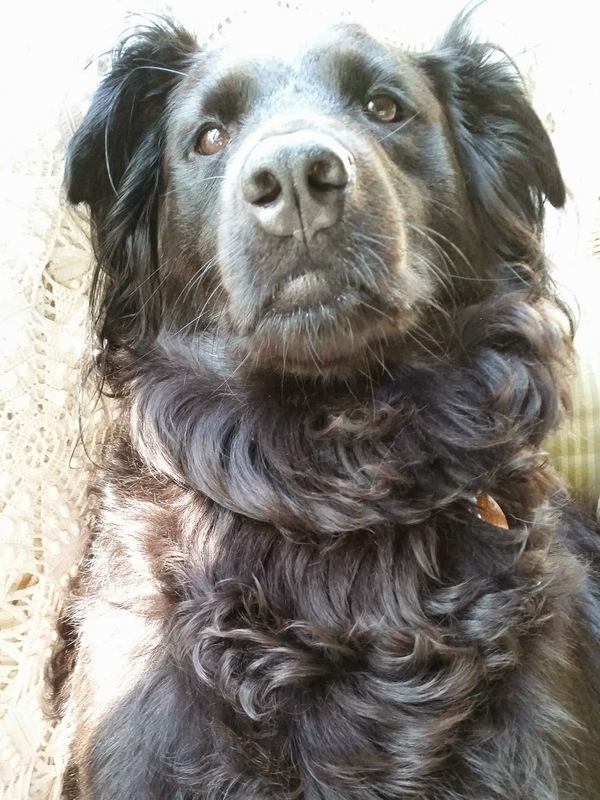 A Day Gone Wrong--Doggone Wrong! Where do you find inspiration for your craft and sewing projects? Lately though, I seem to have a one track mind. 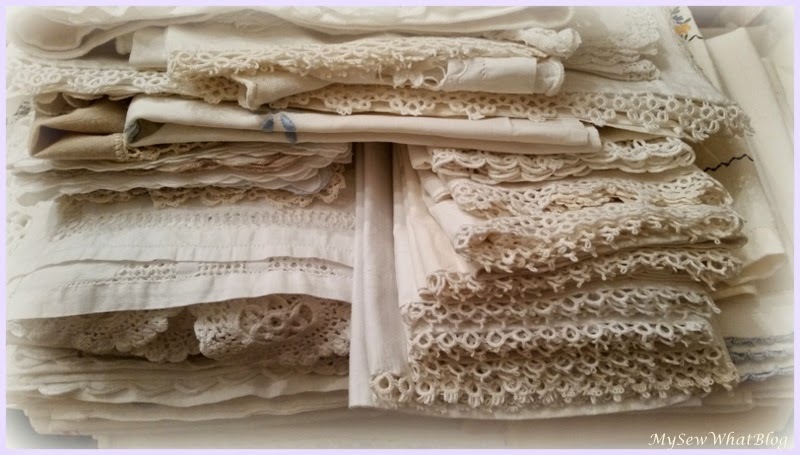 Linens are my inspiration for everything.....One trip to the antique shop and I can find plenty of inspiration. 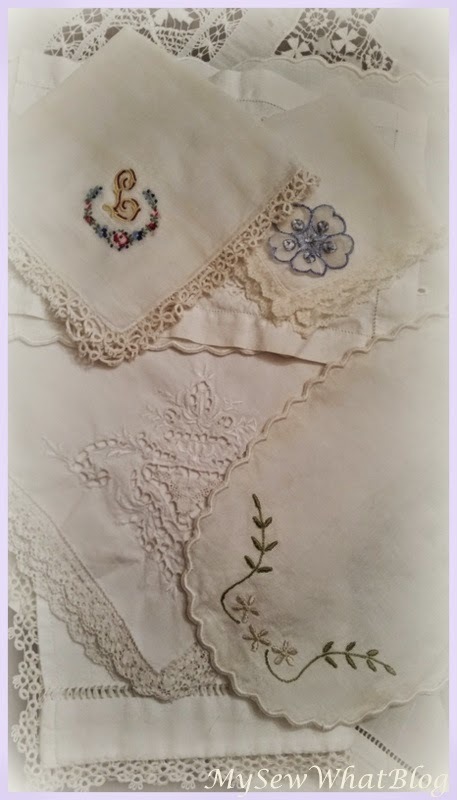 Last Thursday I went to a favorite shop to check out the stock of vintage linens. I went without the intention of buying anything but of course left with a few things I couldn't leave behind. I spent a whopping $13. I found a ziplock bag full of ecru and white vintage pillow cases for $4.00. I washed them right up and ironed them nicely. Just look at all that lovely crocheted lace! The lace alone is worth more than that! Dish towels.....you can never have enough of these! I love linen towels and at .50 to $1.00 it is money well spent! I would much rather have these sweet little dish towels than any of the new mass produced towels that are in the stores. 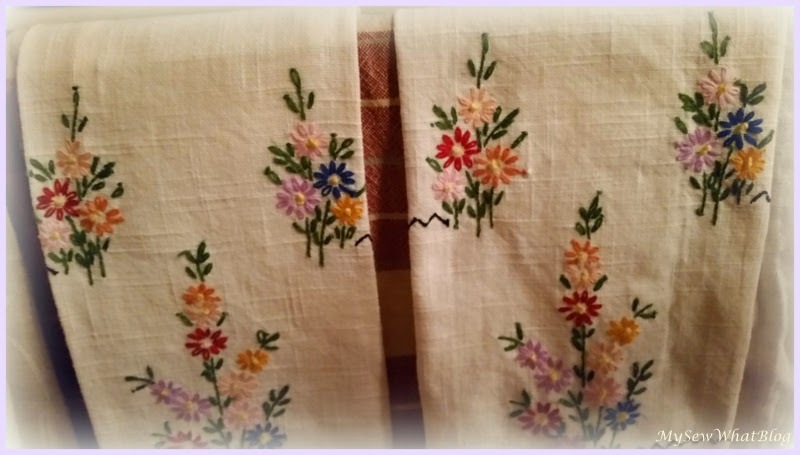 The dish towel on the left is one I bought earlier in the month. I found the one on the right during my most recent trip and was so excited to have a matching pair! These are just the sweetest and they are in mint condition. I doubt they were ever used! 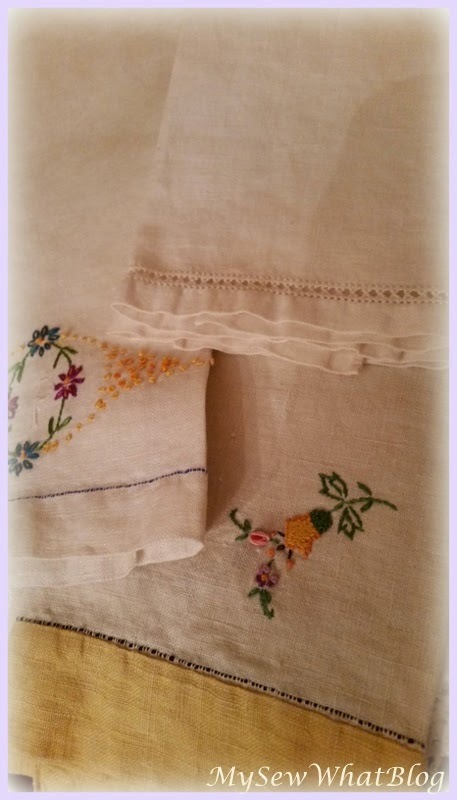 These pieces were in a bundle of other linens. Why yes that handkerchief is monogrammed with an "L" for Linda! It was just meant to be! 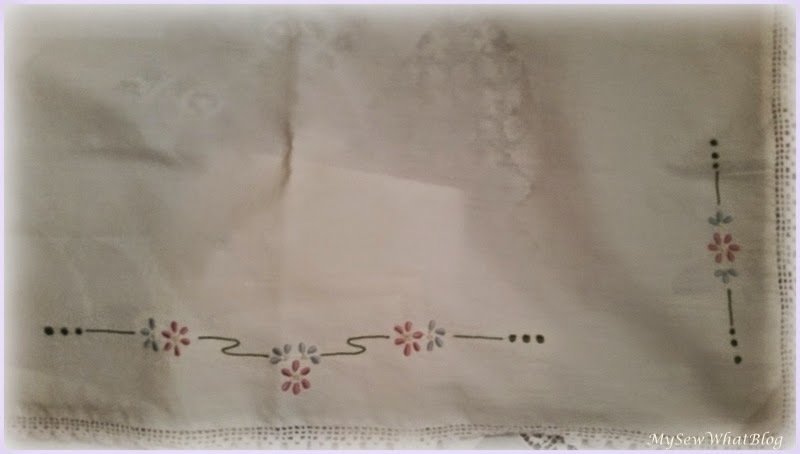 This dresser scarf was also in the bundle with the items above. This was my ironing board after I washed and carefully pressed each item! Which leads me back to inspiration. LINENS! So today I was excited because I had an entire day to sew up a storm and a mass of linens to draw inspiration from.. My husband was out of town for the day and it was just me and my dog Ellie......but my dog had other ideas. My dog loves (is obsessed with) the next door neighbors and they love her too! She hasn't seen too much of them over the winter because we had a major pile of snow dividing our two yards and barricading us in. This is when I determined it was just time to call it quits. Today was clearly about her and not about sewing. 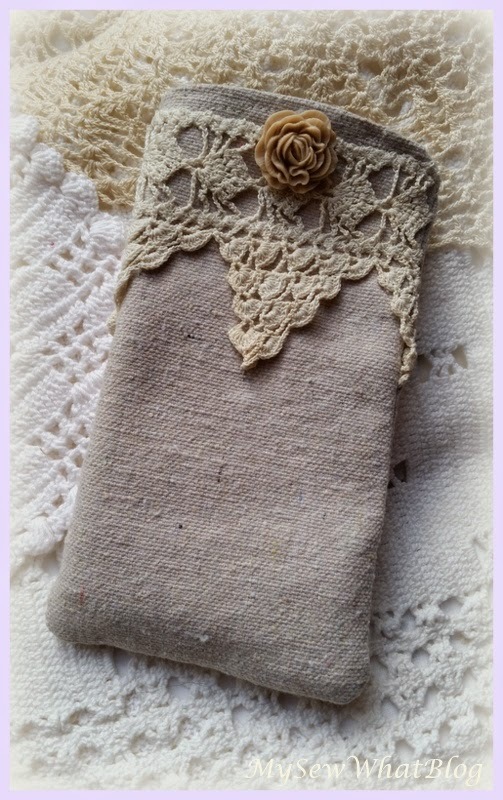 I did manage to cut out a tote bag and I quickly stitched up a phone case which I displayed at the beginning of this post. It isn't perfect by any stretch of the imagination but it did get done and it is definitely inspired by my love of linens. 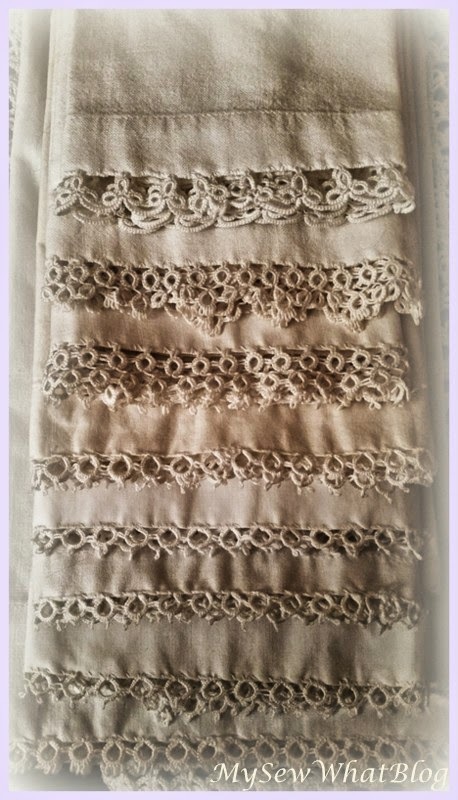 I even used a scrap of lace leftover from one of my heart pillows. It took about 15 minutes because that's about the largest stretch of time I had between doggy distractions.! My sweet Ellie.....she really is very sweet.......I adore her!